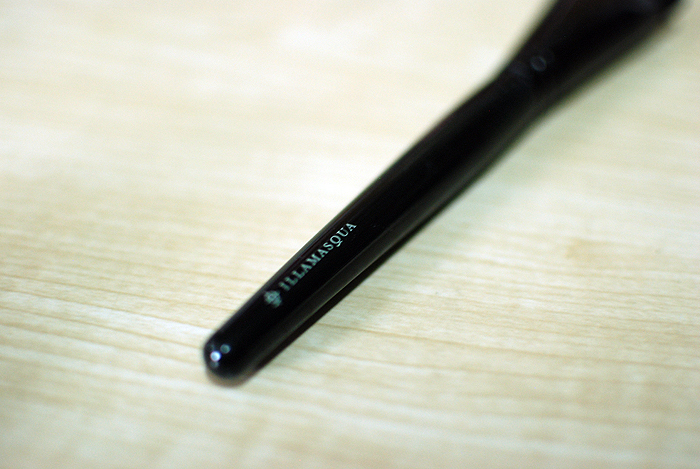 Here’s a super quick post on one of my favorite tools as of late: my recently-acquired Blush-Up Brush from Illamasqua! It’s a very tightly-packed, narrow brush with short, soft bristles and a long handle. It’s supposed to apply blush in a revolutionary~ way, eliminating the need for a contour. Here is a tutorial from the Illamasqua team, explaining how. As you can see, it deposits pigment in a different way than brushes usually do. 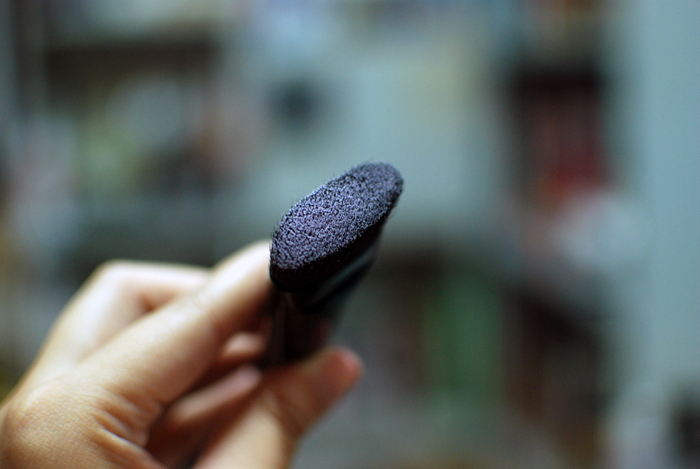 Going by the shape of the Blush-Up Brush, it’s supposed to apply blush in an angular way. When placed right under the cheekbone, it creates a stark line that highlights the hollows of the cheeks, which I suppose is what they meant by it “eliminat[ing] the need for contour.” I don’t know if it works all that well for me if I use it like that, but it does really well for normal blush and contour application, which I think it should be recognized for. Tarte’s Exposed used to be my “standard” for a good blush brush. If the brush can make it appear on my cheeks, its a good one in my book! Predictably, this did very well for Exposed, so I wanted to make this a bit of a challenge. It’s a very pale, very light blush I bought on a whim in Japan… Because I am delusional. My shade is usually medium, so I don’t know why I thought this would suit me. Or show up, at least. I haven’t really had any success. I layered this over Exposed, which I wore earlier in the day. It has faded quite a bit. From here, you can see that the blush actually shows up! The color is most noticeable in that high area near the hollows of the cheeks, under the cheekbones, near the hairline. Is it a necessary brush? At the price point of £30, I’m inclined to say that I don’t think so. It is excellent at what it does, but I’m sure you can find a cheaper brush that applies blush and even contour just as well. It just really makes it easier to get that angled look. I love it because it makes blush application—and getting great pigmentation—easy. It’s not a must-have for the casual makeup user, but it’s very, very nice to have if you’re trying to build a brush stash of higher quality or if you just like more expensive brushes that are pretty to look at, work really well, and don’t shed. 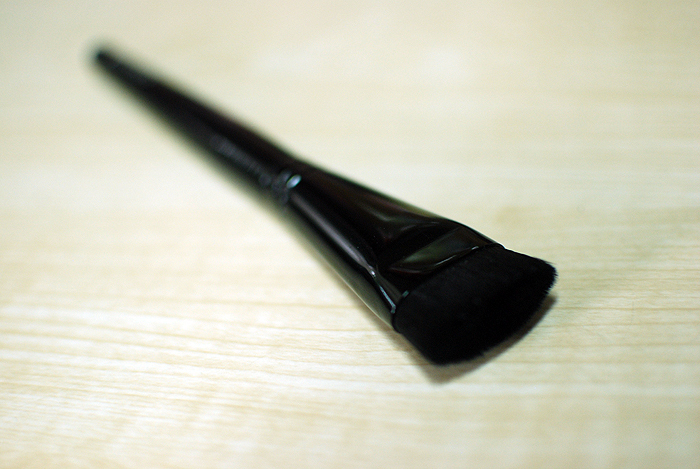 The Illamasqua Blush Up Brush is $40 or £30. 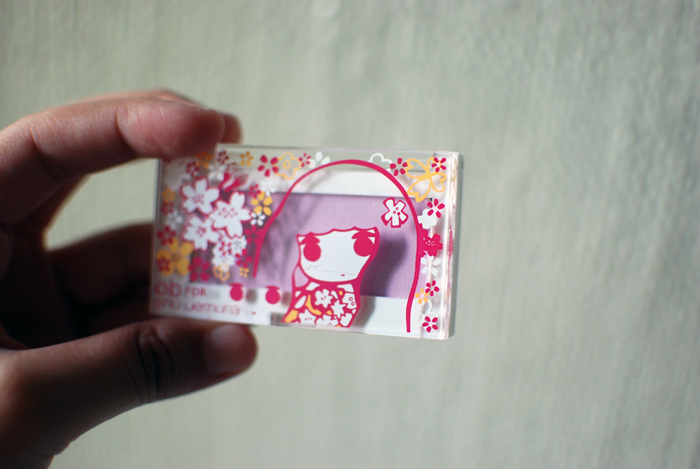 I got it from Sarie, who purchased it from Sephora. Illamasqua is a cruelty-free brand. It’s really interesting to read Illamasqua’s “eliminating the need for contour” claims. This brush is definitely unique – I don’t think I’ve seen one quite like it before. The eyeshadow you’re wearing is absolutely beautiful! O.O I find it a little strange that they want something that’ll have such a harsh line – blending out blush and contour colours was one of the hardest things I found when i first started doing makeup. I think I’ll stick with doing both blush and contouring (or blush and highlighting) though. The model in the video looked gorgeous, but it’s not a look you’ll want to replicate for everyday makeup. Do you think it can be used to sweep foundation on the face? It looks a lot like MAC’s 163 and one of Virginia Olsen’s latest makeup brush collection.